This section introduces CsvDataSourceServlet. CsvDataSourceServlet is an example implementation that uses a CSV file as an external data store. This section also provides step-by-step instructions on how to run and test CsvDataSourceServlet. Note: You should complete the Getting Started with Data Sources section before you begin this section. The CsvDataSourceServlet class is located in the examples package. This class provides an example implementation that uses a CSV file as an external data store. CsvDataSourceServlet inherits from DataSourceServlet, implements generateDataTable(), and must be run within a servlet container. A snippet of CsvDataSourceServlet is provided below. The generateDataTable function exposes data to the library. This function creates a data table description, defines the data table columns, and populates the data table with data obtained from a CSV file. The CSV file is read from a URL specified in a requesting visualization's query. The library handles all other actions required to return the data table to the querying visualization. * A demo servlet for serving a simple, constant data table. * query engine to apply it to the data table created here. * The name of the parameter that contains the url of the CSV to load. * Generates the data table. This section provides instructions on how to run and test CsvDataSourceServlet. Copy this file to the <tomcat_home>/webapps/myWebApp directory you created in the Getting Started section. The screen displays 6-7 lines of text, depending on your screen width. 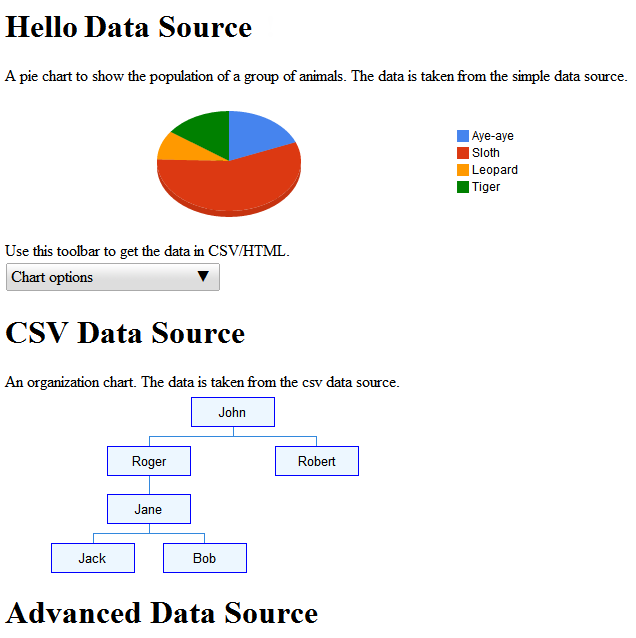 If you view the source of the all_examples.html file, you will see there are three visualizations included in the file. The following snippets reproduce the specification of these visualizations. For more information on how to specify a chart and use the query language, see Introduction to Using Chart Tools and the Query Language Reference. Copy the all_examples.html file from the <data_source_library_install>/examples/src/html directory to the <tomcat_home>/webapps/myWebApp/ directory. Click the following link: http://localhost:8080/myWebApp/all_examples.html, you should see the following visualization. The Advanced Data Source example is discussed in Defining Capabilities and the Flow of Events. For an introduction to the library's most commonly used classes, see Key Classes. Instead of having the data source inherit from DataSourceServlet, you can have it inherit from another class. For more information, see Using Your Own Servlet. To learn about how to pass parameters from an application to a data source, see Passing Parameters to DataTableGenerator.generateDataTable.